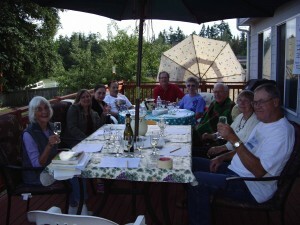 This weekend was another great scene for a taste to learn event where we can be out on a deck in the summer. Thanks go to Kent and Karla for hosting this event in their home in Graham. Having Taste to Learn events are great on the weekend as it gives us a chance to travel further to visit members homes then we would feel comfortable with on a Friday night in traffic. Chenin Blanc (Shen-in Blahnk) is arguably the most versatile of all wine grape varieties. Crisp, dry table wines, light sparkling wines, long lived, unctuous, nectar-like wines, and even brandy are all produced in various areas of the world. It is the most important white grape variety of the central Loire Valley of France and is France’s most successful export variety. The three main producers are France, South Africa, and California. It ranges in style from bone dry to medium sweet to staggeringly rich. In all styles expect high levels of acid that can provide tremendous amounts of balance to these wines, especially the sweeter varieties. Regardless of how sweet the wine is, general characteristics of Chenin Blanc include natural honey, rich texture, bright acidity, citrus fruits, melon, peach, pear, apple, quince,spice, almond blossoms, as well as spring flowers, in addition to assertive mineral and earthy tones. Both dry and sweet styles of Chenin Blanc are known for their longevity, good versions can be aged for decades to produce deeper, richer, spicier and nuttier flavors. A hallmark flavor is a strange one and appealing more in experiment than theory – a lanolin scent like sheep’s wool or hay or beeswax. The best Chenin Blanc offers high acidity combined with a touch of viscosity – leaving an oil-like mouth feel. In spite of its wide plantings and potential flavor palates, most Chenin Blanc is made into serviceable, but generally bland wine. A general tendancy to over-irrigate and over crop further reduce most Chenin Blanc to the forgettable. But there are excellent wines also being produced, nearly all the truly memorable Chenin Blancs are French, from Saumur and Savennieres (dry), Anjou and Vouvray (off-dry), Coteax du Layon and Quarts de Chaume (dessert), and Cremant de Loire (sparkling). No matter what the style, a certain floral, honeyed character, along with zesty acidity are the sensory trademarks of well-made Chenin Blanc. South Africa is the top destination for reasonably priced, quality Chenin Blanc. Some descriptions: “At first whiff, a basket of pears and ripe apples. It has a lush and creamy mouth feel with flavors of apples, pears and honey. The flavors linger on the palate- with a recollection of creme soda”. “Welcoming nose of woodsy fruit, green apples and mangoes, a noticeable flintness. A soft textured palate held together with by grainy minerality. Pair dry Chenin Blanc with light fare, salads, and goat cheese, pork, chicken, rich shellfish, mild to spicy rice dishes, sushi, seafood and poultry. Our club tasting began at 4:30pm. We had 10 evaluators. Jerome & Mary presented the background on the Chenin Blanc grape, characteristics to look for and different styles. We had 2 benchmark wines to identify the chenin blanc charcteristics. First poured was a Washington state Chenin Blanc 2007 from Kiona winery. The other benchmark wine was a French Chenin Blanc Vouvray, Domaine de Aubusieres 2008. There was an interesting mistake during the tasting that sure got everyone’s attention. The 4th wine served was actually a Viognier; it had slipped by when the wines were put in bags. As the participants tried to evaluate it based on our expectations of a Chenin Blanc, eyes became questioning to others and quizical expressions were exchanged. On the reveal of the wine everyone was pleased to see that it indeed was not a Chenin Blanc. Pretty good learning I would say.